Five student residents of Bulldog Village apartments were displaced last night as a fire severely damaged one apartment and smoked out another. Fire units that arrived were dispatched at 6:04 p.m. They extinguished the flames within 10 minutes after arriving, but the blaze had all but consumed the bottom three-bedroom apartment. Battalion Chief Cirilo Medina of the Fresno City Fire Department said that heavy smoke damage had also occurred in the upper two-bedroom apartment. â€œWhat they had on arrival was fire coming from the downstairs unit, from one room specifically, and flames lapping up into the second floor,â€ Medina said. â€œOur crews did a very good job. Upon arrival, they went inside and knocked [the door] down, so they knocked on the bulk of the flame pretty quickly,â€ Medina said. At 7 p.m., crews were still unsure what caused the fire, but they had singled out the room of origin where most of the damage had ensued. The names of the five displaced Fresno State students were not released, but Medina said the three from the bottom floor and the two from the top were being assisted in finding housing at the complex. Senior Lionel Akpovi was managing the 5 to 8 evening shift at the complex when he heard the commotion and ran outside to investigate. Other residents recounted a scene that was much more horrific. â€œI was walking by when it started and flames were shooting out the window,â€ said Fresno State freshmen Chris Gauthier, one of several to call 911 last night. 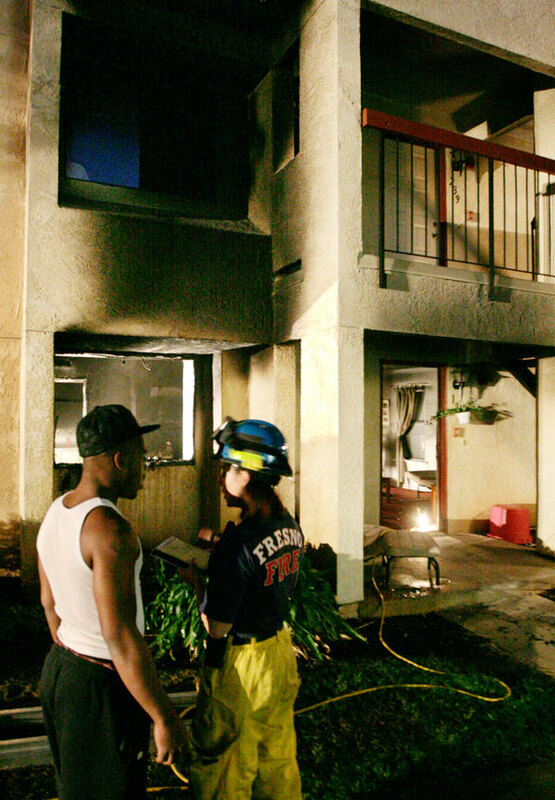 Fresno State junior Brandon Swain was among the first on the scene when the fire broke out. â€œMe and my buddies tried to put it out, but that didnâ€™t work,â€ said Swain, who lives in the building adjacent to the damaged unit. Swain said the burning apartment was empty when he and seven friends entered through the front door. They were still using nearby fire extinguishers to suppress the flames as emergency units pulled up. Fire crews continued to retrieve the burnt remains from the apartment in hopes to discover the source of the fire. Medina said that they would also be checking for any hot spots within the unit so that they wouldnâ€™t have any incidents where they would have to come back.